The basic objective that most Monticello Associates clients strive to achieve is to maintain– and, ideally grow – the purchasing power of their portfolios over a long-term time horizon. In order to achieve this objective, clients must generate sufficient returns to cover portfolio spending, inflation, taxes, fees and expenses. Spending and inflation generally grow at a steady rate, but portfolio returns can vary widely from year-to-year, causing clients to gain or lose pace against their ultimate objective. For much of the past fifty years, institutions could very nearly meet a 5% spending requirement simply by harvesting the income from a traditional 60/40 portfolio. However, as interest rates have declined over the past three decades, the gap between the current yield and 5% is as large as it has ever been. If investors cannot rely on current yield to meet portfolio spending needs, then equities must pull even more weight than they have in the past. While the picture for equities looks more encouraging than for fixed income, investors should be cautious in their expectations for the asset class. After seven straight years of positive returns, equities are trading at a price-to-earnings ratio of about 20x, above their long-term historical average of 16.7x. Investors have historically earned their best returns when starting valuations were below average. 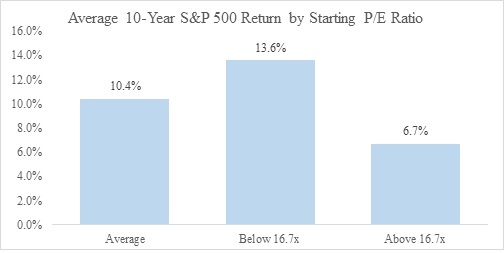 Starting from today’s relatively high valuation of 20x, the average 10-year return has been only 5-7%. If we assume approximately 5-7% returns from equities and 1-3% returns from intermediate bonds, then an investor holding a traditional 60/40 portfolio would realize a return of only 3.5% to 5.5% over the next 10 years. This compares against an average rolling 10-year return of 10.3% for a 60/40 portfolio since 1980. An institution facing lower returns and wishing to maintain the real purchasing power of the portfolio essentially faces two choices: 1) increase risk in an attempt to generate higher returns or 2) modify spending policy to compensate for lower returns. While neither option is particularly appealing, we would argue that now is the wrong time in the investment cycle to increase risk. Given tight valuations and the potential for volatility, the penalty for increasing risk could be particularly severe. According to the 2015 NACUBO-Commonfund Study of Endowments, the average policy spending rate for university endowments was 4.7% in 2015. This rate does not vary much by institution size and has been remarkably stable over long periods of time. If we assume 2% inflation, then an institution with a 4.7% spending rate that aims to maintain the real purchasing power of the portfolio must generate about a 7% nominal return. 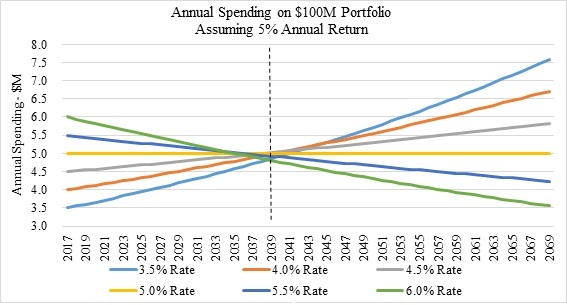 The problem is that achieving 7% returns may prove exceptionally difficult over the next decade, suggesting the most conservative and prudent action would be to decrease the policy rate of spending. The following table shows the results of a Monte Carlo analysis considering various rates of expected return and spending for a hypothetical portfolio. 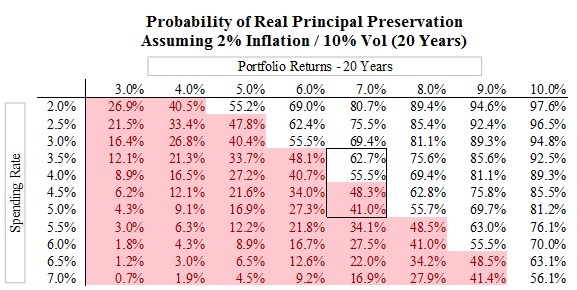 The results are very intuitive and show that even a 50 – 100 bps reduction in portfolio spending significantly increases the probability of maintaining the real purchasing power of the portfolio as measured over a 20 year period. Furthermore, institutions face a very real tradeoff between current spending and future spending. Maintaining a spending rate that exceeds the portfolio return will lead to higher spending in the short-term, but doing so will degrade the value of the portfolio and thereby lead to lower spending in the future. Conversely, maintaining a spending rate below the portfolio’s realized rate of return will allow an institution to grow the value of the portfolio, leading to higher payouts down the road. As the following graph illustrates for a portfolio generating a 5% annual return, the level of support at various spending rates converges in about 20 years. Of course, many institutions rely heavily on portfolio payouts to support their mission, making spending cuts particularly painful. Others simply cannot reduce their rate of spending for tax reasons. While reducing spending may not be possible for all institutions, there are a variety of alternative policies aimed at moderating spending increases that may be more appropriate for the current environment. At the very least, investment committees should consider reviewing the current policy to understand the potential impact on the long-term real purchasing power of the portfolio.